Langford started the 2017/18 season with Rob Bates in charge but he and his staff left the club towards the end of September to be replaced Rob Verdiar who has also brought in a new management and coaching team. The playing squad has also changed drastically with just Lewis Sinclair remaining in the starting XI for this game at The Gosling Stadium compared to their opening game of the season in the FA Cup against Hadley. They included former Hatfield winger Sean Mboto in their team. Going into the game Hatfield Town's league record was just two wins in fourteen games with Langford's four wins in twelve games - It was 16th v 15th in the table. The home side were without a win in nine league and cup games. It started well for the away side when Luke Smith headed home on two minutes from a short corner and cross into the box. 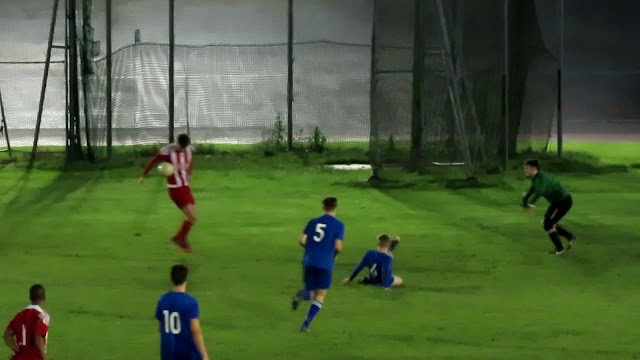 They then took a two goal lead just after the half hour mark when Ethan Draper was left with space to easily score after a long throw into the box. Hatfield played some good football at times but failed really to create any real goal scoring chances - On another day I think they would of scored at least one goal with a little more luck and composure in the penalty box. There was a couple of interesting talking points in the first half - Jack Edwards was very harshly booked for what appeared to be a fantastic tackle (see the highlights video from 2m 40secs) and could it of been another goal for Luke Smith when an offside flag ruled one out (was it the correct decision - see the highlights from 3m 55secs). In the second half it was another set-piece and another goal for Langford. A long throw into the box was skillfully back-heal volleyed into the net by Luke Smith who got his second goal of the game. Smith could of had a third but he was ruled to have handled the ball before lobbing the ball over the keeper - Another talking point? Was it the right decision? (Have a look from 6m 20secs). 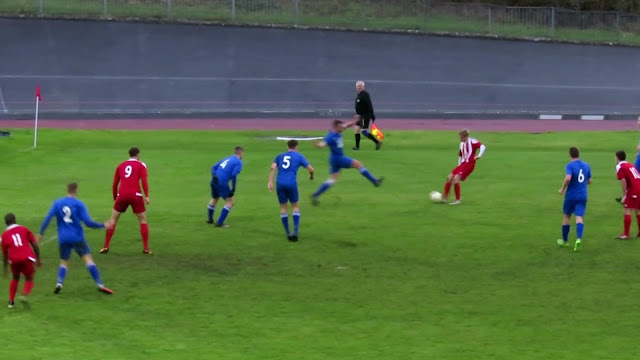 The Blue Boys came back into the game when Chris Gray headed home from a free kick into the box but it was Langford who could of extended their lead when they hit the cross-bar from a short from outside of the box. Langford went on to gain a good draw (0-0) at home to Baldock Town on Tuesday evening. They welcome London Lions to Forde Park at the weekend. Hatfield Town have a run of four games at The Gosling Stadium starting with Wodson Park visiting on Saturday. The Blue Boys continue to play their football at The Gosling Stadium. Their average crowd in league and cup games this season is 26. 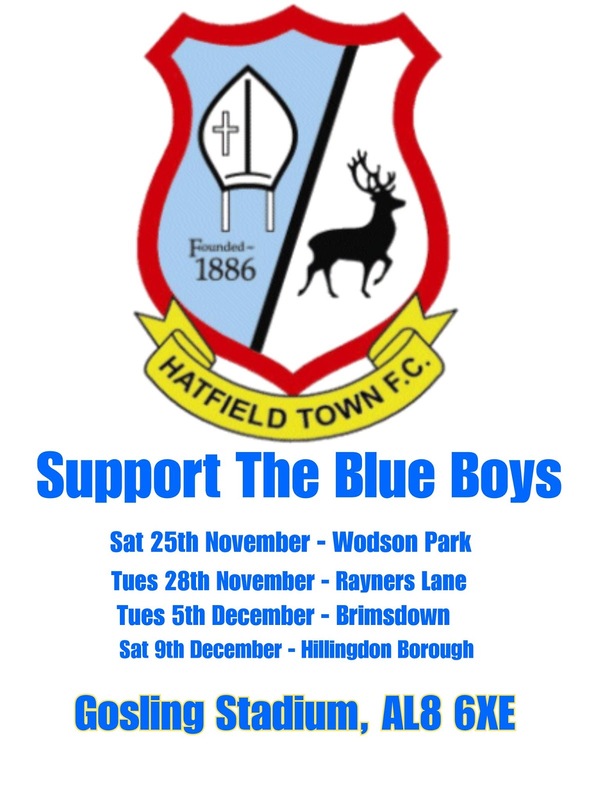 It would be great to see a few more people support their local club.